Did you know that your herb garden is not only useful for cooking and medicinal reasons? Herbs have many other uses and have long been used in making dyes. You can use them to dye your own fabrics, yarns, and more, as well as use it to make hair dyes. 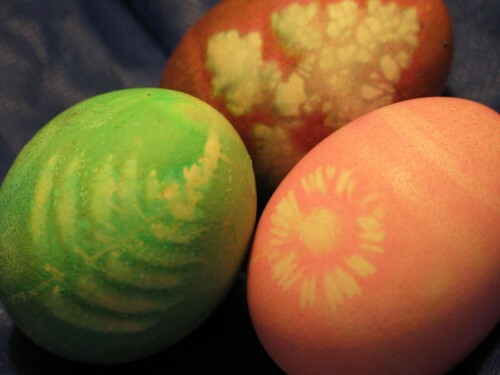 And of course, Easter eggs! It is not very hard to make dyes from herbs but it can take a bit longer than just opening a package of dye. But the results are well worth it. There are a lot of herbal plants that can be used to make dyes but those mentioned below can easily be found in most regions of the United States. You can either find them growing wild, or just grow them yourself. The parts you want to use for making dyes are mostly the roots and aerial parts. An ingredient called a mordant is usually added. This allows the dye to bind with the material being colored. Examples of mordants are alum, iron, tin and vinegar, and the color you produce is mostly dependent on which of these mordants that you use in making the dye. Different mordants can produce different colors of dye even with the same plant. What is interesting about herbs used as dyes is that most often, the resulting color is something unexpected and far different from the color of the herb being used. For example, yellow Gallium produces tones that range from brick red to coral while pink heather creates a golden color. 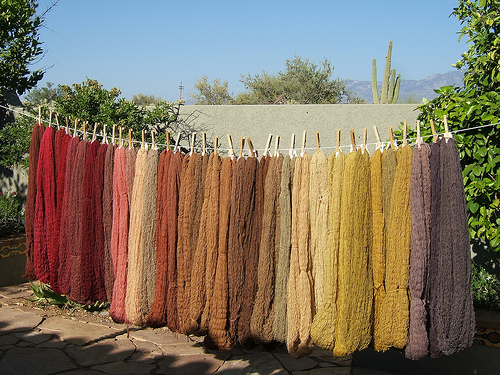 The great thing about using herbal dyes is that although the colors are more variable compared to using chemical formulas, the richness and depth of its resulting colors is unmatched and is surprisingly much more pleasurable to the eyes. A lot of different kinds of herbs can produce almost the same colors and tones. The colors blue and purple are usually challenging to come by that is why in the olden days, these were considered royal colors and cloths made in these colors are rare and expensive. Creating a dye usually comes from boiling or simmering plant parts. For an intense color, you will need more plant material to use and tougher, woodier parts need more time to boil. General Rule of Thumb: Start by taking equal weights of your plants and material you will be coloring but to get the desired result you may have to double the plant portion. Once you have gathered your plant parts, chop them up. Tougher parts like stems and roots need to be chopped and crushed, while flowers and leaves can be chopped up only slightly just to expose more surface area. For tough, fibrous plants, you may want to soak them in water overnight so they will be softer before chopping. While it may be fun to create your dye, the somewhat challenging part is preparing the material you will color. Cloths, fabrics, yarns and others need to be cleaned as well as treated with a mordant before you dye them. The upside in having to do this hard work is that it results in the fabrics absorbing the color better, which also keeps it from washing out. Wash the material in a machine with hot water and washing soda (sodium carbonate). Make sure you do not add any fabric softener. With the use of a large stainless steel or enamel pot that is half filled with water and an ounce of washing soda per pound of material, add the material in and bring the mixture to boil. Once boiled, reduce to rolling boil and continue to process for another 2 hours while stirring every 15 minutes. When done, allow cooling, remove material and rinsing in clean and cooling water. To create the dye, fill in a stainless steel or enamel pot with enough water to submerge your material fully and with enough space to stir. Slowly add the herbs and bring to boil. Continue boiling for 1-3 hours or until color is drained from the plants into the water. Strain the plant parts, separating it from the water and allow the water to cool down. The last step for your material is to add a mordant into it. As explained before, there are different mordants that can be used and each will result in different color in some way. Mordants can be bought commercially at a store. You should easily be able to follow instructions written on the package but generally what you need to do is allow the mordant to simmer before adding in the material and letting the mixture simmer together for another hour before moving the material to the dye preparation. Once the dye preparation has been cooled and the material has been treated with a mordant and cooled as well, transfer the material into the dye preparation and bring them to simmer for another hour while checking from time to time to see if you have achieved your desired color. For better results, allow it to color darker as some color will still wash out during the rinse. The final step is to rinse in a bucket of hot water first, bucket of warm water next and lastly to a bucket of clear cold water. Hang to dry. 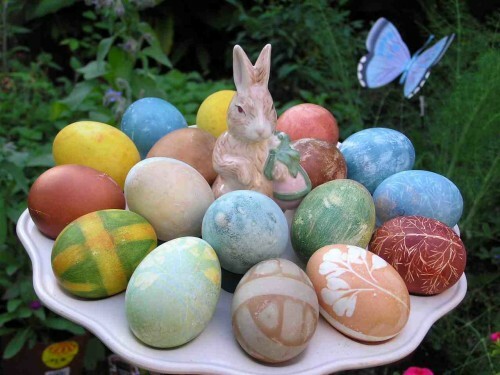 To get cool patterns and shapes, you can wrap the eggs with rubber bands, put stickers on them, or use leaves or flowers, then wrap the egg tightly in old pantyhose. 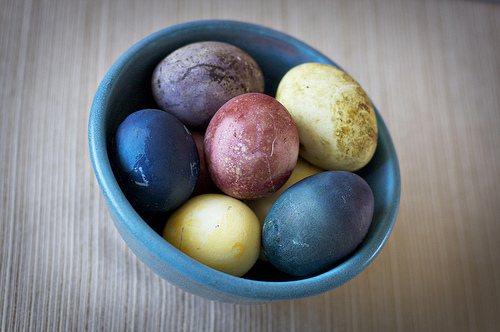 Then put your dye in a pan, coffee cup or other container that will allow you to submerge your hard boiled eggs. You can also dye eggs you’ve blown out, but you’ll need a way to weigh them down since they will want to float. 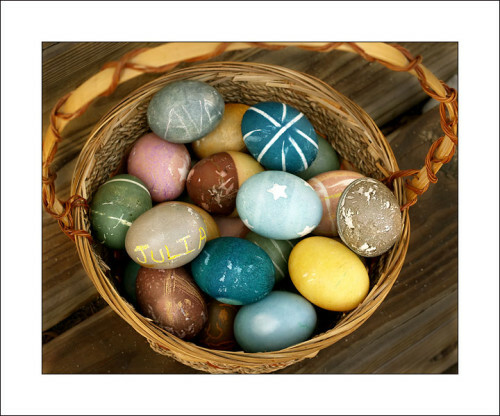 The longer you leave the eggs submerged, the darker your colors will become. Want to join in the fun and link to your own blog? You can share about anything related to natural living, from gardening to recipes to home remedies to anything else related to natural living. PLEASE READ THESE GUIDELINES, especially if you have never linked up before! You are free to join the Natural Living link up at any time. You can also skip a few weeks and then come back. It’s entirely up to you. Please link directly to the specific post on your blog that relates to green living — not your main blog URL. Please only link to your own blog or photos hosted online. That’s it! Share your natural living post with us by linking up below! Tiffany, thank you for hosting this link-up. I messed up with the wrong photo, so if you delete it, I can replace it correctly. Appreciate you! Please go right ahead! You may want to use Evernote Clipper or Clearly, copy it into Word or you can use the Print Friendly button above to (or the previous link) to make the content easier to print. Dandilions will NEVER give any shade but yellow or green! The purple/magenta/pink is an old wive’s tale with no basis in fact. There are NO Anthocyanins in a dandilion, in any part of it, which is where those colours come from.